Named after the iconic Australian beach, Bells Beach is a luggage brand with a major focus on versatility and practicality. With uncomplicated yet stylish designs, their canvas bags come in a wide variety of designs and suit all needs, be it a relaxing day at the beach or a weekend adventure. Take to the skies in style with this amazing Canvas Tote Bag. Crafted from canvas, the large main compartment is incredibly spacious and features a zippered closure on top, allowing for easy packing. The small zippered pocket on the front is ideal for smaller items. and also included with this bag are carry straps that can be enclosed inside a Velcro handle, as well as an adjustable and detachable shoulder strap. 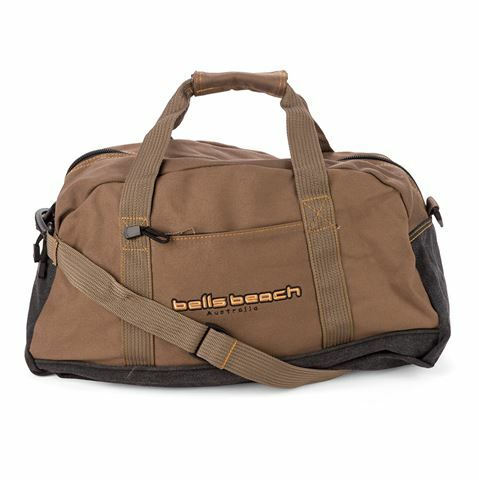 Spacious main compartment features a zippered closure on the top for easy packing. Small zippered pocket inside the main compartment. Carry straps with a Velcro handle. Dimensions: 50cm (l) x 28cm (h) x 20cm (w).